I finally finished my Master Gardener classes! My final took my six hours to finish... that's right, 6 long hours! I learned a lot about everything gardening, but only scratched the tip of the iceberg. The information is endless, but it's so fun learning! Already my training is coming in handy. While you can plant trees any time, fall is the best. Cooler temperatures create less stress on the plant, and the need for less water. 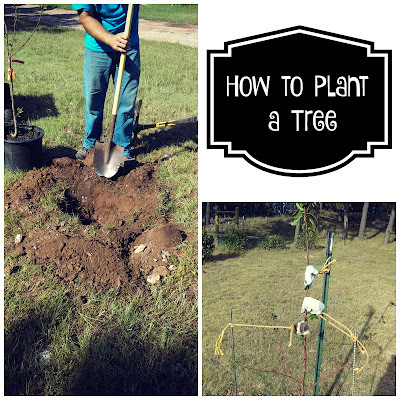 You don't want your tree going into winter still trying to recover from the heat and drought of summer. Fall still allows the roots enough time to become established before winter. 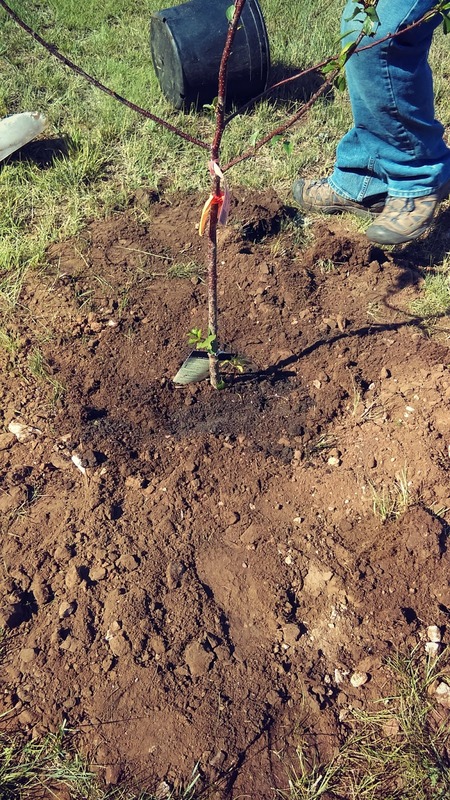 The tree I'm planting is an Evans Bali Cherry. It's tolerant of pretty much any soil pH, so I didn't test my soil for that. I did a lot of research before purchasing my tree, and I suggest you do the same. 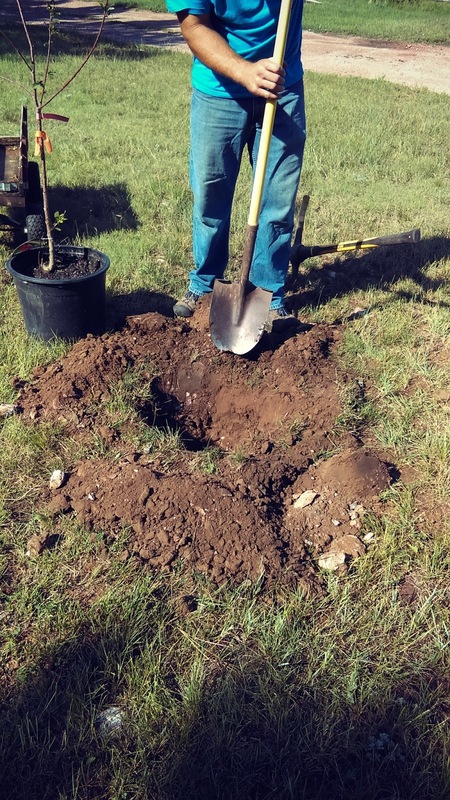 There are three types of trees available for planting. Bare-root, container and balled-and-burlaped. 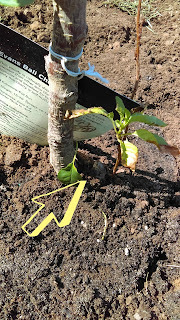 While bare-root is the best method, my local garden store had the tree I wanted in a container so I went ahead and got it. Regardless of whether you are planting a container, bare-root or balled-and-bulap tree, dig the hole three times wider than the roots and no deeper. No matter what type of container the plant is in, remove it. If the roots are pot bound, this will need to be corrected. DON'T split or cut the root ball! Instead gently shave the sides by cutting all the way around it. I don't have a picture of this because my plant wasn't root bound, but I did find a link that does have some nice visuals of how to do this. Make sure the bud union (where the graft is) is above the ground. 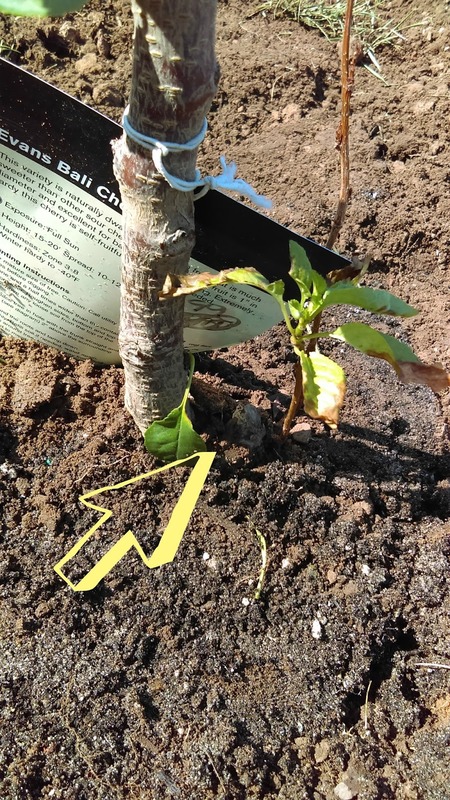 Planting too deep can cause the root stock to produce shoots that can over run the grafted stock, or cause issues that can kill the tree in the long run. When back filling, use the original soil that was in the hole. Don't put fertilizers into the hole or back fill. This may burn the roots. 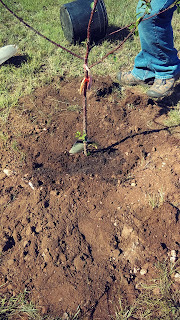 The surface should be slightly higher that the surrounding ground, but still not above the tree graft. If your tree doesn't require staking, don't stake it. My tree had developed a weird curve that needed to be corrected. When staking, make sure you don't bind the trunk. 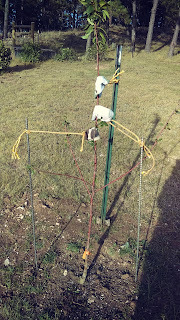 I used my kids old socks to protect the truck from the rope. Support shouldn't be attached higher than 2/3's the height, and shouldn't remain for more than one year. When adding mulch, less is better. A coarse mulch of no more than 2 inches deep, can be spread three feet out from the trunk. Be sure to leave about six inches of bare soil right next to the tree. Trees need one gallon of water for every inch of trunk diameter. Water daily for the first 2 weeks after planting, the every other day for a month. With proper planting, I should be able to enjoy this tree for many years to come.